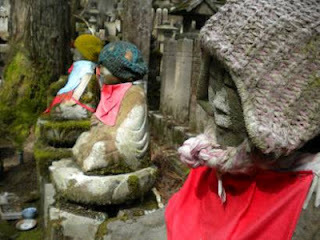 Some of Koyasan's many moss-covered Buddhas. It's hard to believe the Blogathon is over already. As always, there is some relief and some sadness. Relief that the pressure is off to post every day, and sadness that the other 250 (give or take) people I've been working with this month will wander off into their own electronic lives. There's also, to be frank, some sadness that the pressure to post every day is off, too. I work better with firm deadlines and the prospect of a stern tone. Perhaps that's the result of my Midwest upbringing. And as usual I'm coming away with more than a few lessons learned over the course of the month. Here are the highlights. 1. I'm actually pretty good at this. OK, I usually don't toot my own horn quite so much, but I seriously find that I enjoy reading my own writing and that my content is good. I work hard to not put up fluff material just to fill the space, and I spend a fair amount of time researching my content. Crafting the paragraphs is getting faster, but I still work carefully to make sure the words flow well to produce an image or feeling I think readers can relate to and enjoy. I may only have a handful of followers, but if those folks are going to take the time to read what I've got to say the least I can do is give them my best. 2. I love writing this blog. This goes with the first one, but I think it's important to say directly. Writing this blog helps me sort out the things I'm doing in the garden, on the farm, and in the kitchen, and tie them all together. I throw in a bit of travel now and again because everywhere is something to taste, to see, and to share. There are those that pooh-pooh blogging, but this month helped me clarify that I don't agree with them. I might just be another voice in the wilderness (of my garden, that is), but I'm creating community, sharing what I think is relevant, and hopefully offering a bit of enjoyment to boot. I wrote about this earlier, but I've found it such a brilliant thing that it's worth mentioning again. Sitting down to write out a basic schedule of things I want to write about for the month was clarifying, fun, and helped me remember the many things I wanted to talk about here. Most of all it helped me and my Muse work out a balance in our schedules, and there's something to be said for that. 4. I'm not writing in a vacuum. The community of blogging and writing is wonderful, and through the Blogathon I've met some really great people doing impressive things. Many of them have commented here, written guest posts for me, and helped me grow as a person and as a writer. That may sound trite, but it is true. Such encouragement and feedback has improved the quality of my writing, given me focus, and made this whole process more enjoyable. Others stop by to tell me they decided to visit a farmers market based on my recommendation or to say they like what they see enough to ask me to write for or with them. How happy a thing is that? 5. I suspect I could do this the other 11 months of the year. I'm not sure if I could blog every day for the year. Do you think you'll try that now? You are crazy, Joan, but guess what, I have been thinking the same! While I'm a bit tired of having to post every day, I've also thought maybe I could keep it up through June. How about that? Shall we challenge ourselves? Your insights closely mirror my own. I love blogging, but now I don't feel so alone (between this year's challenge and last). Well, I guess I've already missed my goal a bit. I do like the idea of a challenge, though, Annette. Shall we? I'd be game and I think it would give me the push I need to keep up the work.